Markay Theatre – Friday June 17th! Join me for night filled with good, clean comedy! 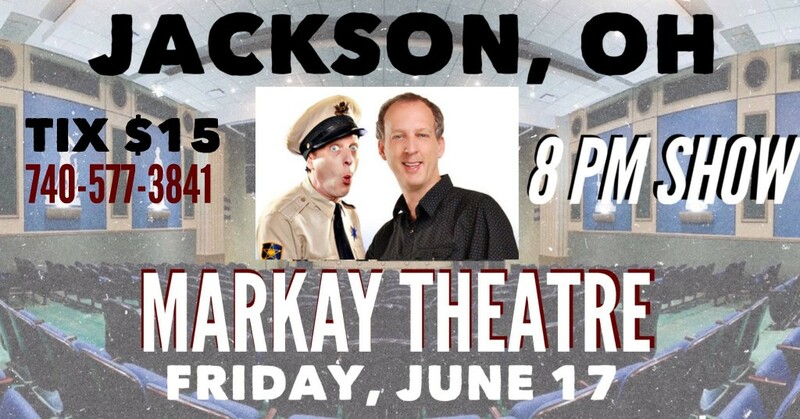 Friday, June 17th I will kick off the show with one hour of stand-up and then return to the stage as “Barney Fife” to arrest troublemakers, patrol the crowd and run off any Goobers! We are gonna rock this place like Ernest T. Bass in a gravel pit! The Markay Cultural Arts Center salutes US military personnel, first-responders, US veterans, and their immediate families. Qualified individuals, including first-responders such as police, EMT, and firemen, may purchase one ticket at full-price and receive a 50 percent discount on the second ticket purchased for a show, eligible for up to four 50 percent discount tickets. A form of military or civil service ID is required at the time of purchase, or at pickup from will call. Thank you for your service! This entry was posted on Tuesday, June 14th, 2016 at 2:55 pm	and is filed under Uncategorized. You can follow any responses to this entry through the RSS 2.0 feed. You can leave a response, or trackback from your own site.